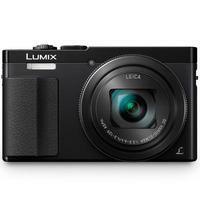 The Panasonic LUMIX DMC-TZ70 is the follow-up to the popular LUMIX DMC-TZ60, and is an all-in-one travel compact with an impressive 30x optical zoom (Leica 24-720mm lens) and built-in Wi-Fi connectivity. The perfect companion for capturing all your adventures, this feature-packed compact camera can shoot stunning stills at 12-megapixels and clear Full HD video footage. The TZ70 comes equipped with a 1.2M electronic viewfinder and a 3.0" 921K-dot LCD to ensure a clear, easy framing experience in all lighting conditions.